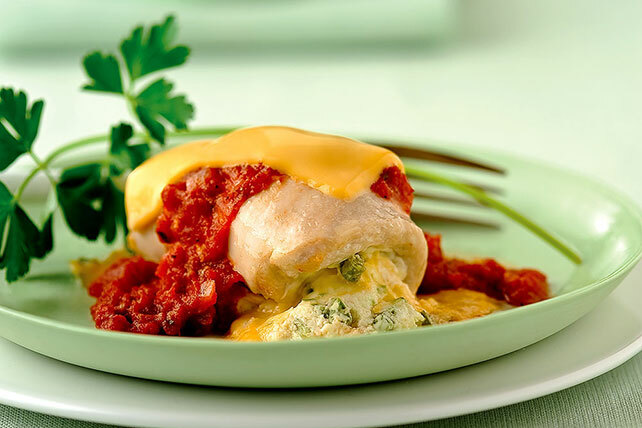 Ooey-gooey inside and out: These Italian-Style Chicken Roll-Ups are a double cheese experience. And a super-easy technique gets it prepped in 10 minutes. Mix cream cheese and peppers until blended. Top each chicken breast with 1 Singles piece. Spread with cream cheese mixture; roll up. Place, seam sides down, in 13x9-inch baking dish sprayed with cooking spray; top with pasta sauce. Cover. Bake 20 min. or until chicken is done (165ºF). Top chicken with remaining Singles pieces; bake, uncovered, 3 to 5 min. or until melted. Substitute 2 sliced green onions for the 1/2 cup chopped green peppers. Serve with a mixed green salad and slice of French bread to round out the meal.